Database searching is not the only way to find great scholarly articles for your research project. Once you have found useful articles, pay attention to the sources those authors use to build their own research. It is likely that the sources that were important to those authors will also be important to your research. All scholarly research should include a thorough bibliography or reference list at the end of the article. 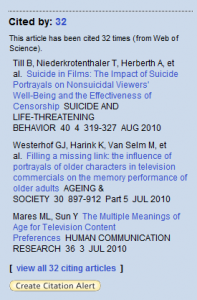 To see if Falvey Library owns an article you have seen referenced by other authors, check the Journal Finder. Either type the title of the journal (not the article) into the search box to then browse for the volume and issue you are looking for, or use the Citation Lookup to search for the entire citation. To search Falvey’s book collection, go to the Search Tab. Use the drop-down menu to search by the title or author of the book you are looking for. Articles and books that are not owned by the library can be easily borrowed through our interlibrary loan system. ILLiad is best for requesting articles, and E-Z Borrow is the preferred method for requesting books that are available in that system. Checking an article’s reference list is a great way of searching the past for related research, but how can you find out what impact that article had on future research? The Social Sciences Citation Index allows you to do just that. Choose the Cited Reference Search to search for the author and journal title of an article you have found to be useful. Search to see if other scholars have cited that article since its publication. Very recent articles will not have been cited yet. Because of the great volume of annual publications, many articles are rarely cited. Also, works may have been cited by research not indexed in SSCI.